The Malian government signed a peace agreement with some northern armed groups on Sunday but the main Tuareg rebel alliance asked for more time to consult its grassroots. The deal, hammered out in eight months of tough negotiations in neighbouring Algeria, provides for the transfer of a raft of powers from Bamako to the north, an area the size of Texas that the rebels refer to as “Azawad”. The Tuareg rebel alliance that includes the National Movement for the Liberation of Azawad said it had asked for a “reasonable delay” for consultations before signing. “An agreement that has not been shared with the people of the region has little chance of being implemented on the ground,” an alliance representative said. But a spokesperson for the Algerian mediators who helped broker the agreement expressed optimism that the rebel alliance would sign soon. A spokesperson for the armed groups that did sign hailed the agreement as “an essential document for restoring peace and reconciliation”. “We have undertaken to respect the spirit and the letter of it,” Harouna Toureh said. 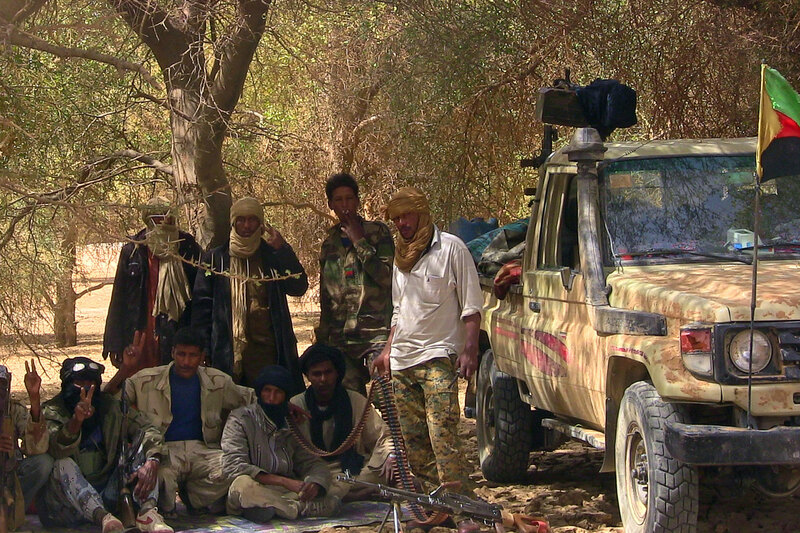 Militants linked to Al-Qaeda seized control of northern Mali for more than nine months until a French-led military intervention in 2013 that partly drove them from the region. Jihadist groups were not invited to the Algiers talks. Mali is scrambling to prevent a major Ebola epidemic after the deaths of an Islamic cleric and a nurse, as the official death toll in the worst ever epidemic of the virus passed 5 000. The two deaths in Mali have dashed optimism that the country was free of the highly-infectious pathogen and caused alarm in the capital Bamako, where the imam was washed by mourners at a mosque after his death. It came as the World Health Organisation (WHO) announced on Wednesday that the outbreak – almost entirely confined to west Africa – had passed a gruesome landmark, with 5 160 deaths from around 14 000 cases since Ebola emerged in Guinea in December. The WHO and aid organisations have frequently pointed out that the real count of cases and deaths could be much higher. In Mali, the latest country to see infections, the clinic where the imam died has been quarantined, with around 30 people trapped inside including medical staff, patients and 15 African soldiers from the United Nations mission in Mali. 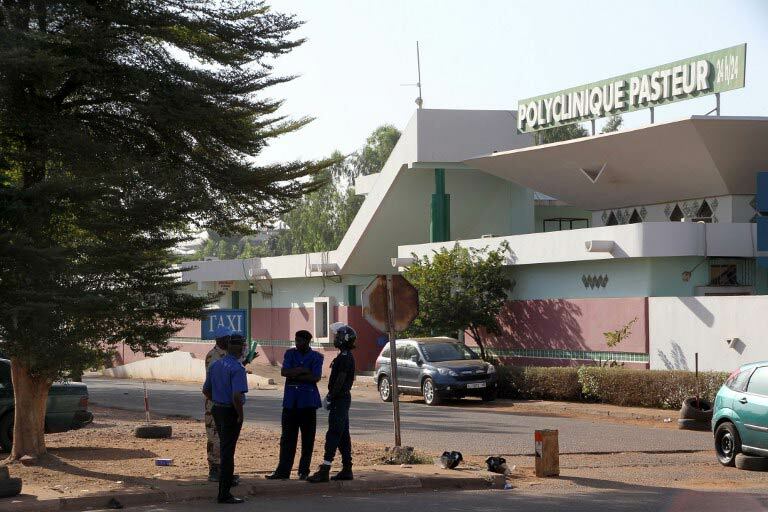 The nurse who died of Ebola had treated the imam at Bamako’s Pasteur clinic. Teams of investigators are tracing health workers, and scouring the capital and the imam’s home district in northeastern Guinea for scores of people who could have been exposed. The deaths have raised fears of widespread contamination as they were unrelated to Mali’s only other confirmed fatality, a two-year-old girl who had also arrived from Guinea in October. A doctor at the Pasteur clinic is thought to have contracted the virus and is under observation outside the capital, the clinic said. A friend who visited the imam has also died of probable Ebola, the WHO said. Mali’s health ministry called for calm, as it led a huge cross-border operation to stem the contagion. The WHO said the 70-year-old cleric, named as Goika Sekou from a village on Guinea’s porous border with Mali, fell sick and was transferred via several treatment centres to the Pasteur clinic. Multiple lab tests were performed, the WHO said, but crucially not for Ebola, and he died of kidney failure on October 27. He had travelled to Bamako by car with four family members – all of whom have since got sick or died at home in Guinea. The imam’s body was transported to a mosque in Bamako for a ritual washing ceremony before being returned to Guinea for burial. Traditional African funeral rites are considered one of the main causes of Ebola spreading, as it is transmitted through bodily fluids and those who have recently died are particularly infectious. The nurse who died treating Sekou, identified by family as 25-year-old Saliou Diarra, was the first Malian resident to be confirmed as an Ebola victim. The virus is estimated to have killed around 70 percent of its victims, often shutting down their organs and causing unstoppable bleeding. Ebola emerged in Guinea in December, spreading to neighbouring Liberia and then Sierra Leone, infecting at least 13 000 people. Cases are “still skyrocketing” in western Sierra Leone, according to the WHO, although Liberia says it has seen a drop in new cases from a daily peak of more than 500 in September to around 50. The US military has scaled back plans for its mission in Liberia to fight the Ebola outbreak, and will deploy a maximum of 3 000 troops instead of 4 000, said General Gary Valesky, head of the American military contingent in the country. But the move did not signal less concern about the threat posed by the epidemic, he told reporters in a telephone conference. Britain’s foreign secretary Philip Hammond announced plans Wednesday for hundreds of Ebola treatment beds in Sierra Leone within weeks, admitting the global response had been too slow as he visited the former colony. The Ebola outbreak has also hit the world of sport. Morocco were stripped of the right to host the 2015 Africa Cup of Nations after insisting on a postponement. Angola had emerged as the frontrunner to replace Morocco as eleventh hour hosts but pulled out of the running on Wednesday. Organisers the Confederation of African Football are due to announce the replacement hosts in the next few days. In New Zealand, police on Thursday ruled out the presence of the deadly virus in one of three mystery vials discovered in mailboxes this week. Tests on the two other vials have not yet been completed. The vials were contained in suspicious packages sent to the US embassy and parliament buildings in the capital Wellington and to a newspaper office in Auckland. Meanwhile in the US, nurses demonstrated outside the White House on Wednesday saying they are woefully ill-prepared to handle an Ebola case. They were among thousands of health care workers taking part in protests in the United States and overseas amid fears the Ebola epidemic might spread beyond west Africa. Two nurses are among the nine confirmed Ebola cases that have been treated in the United States. Dr Mohamed Diagayeté is in an agitated state as he stands in front of stacks of green metal cases containing thousands of invaluable ancient manuscripts from the fabled medieval city of Timbuktu, northern Mali. “Bamako is the worst; it is hell,” he says in halting English. The senior researcher of the state-run Ahmed Baba Institute is not referring to the traffic or Bamako’s urban sprawl, but its climate, particularly the humidity, along with the dust, termites and even mice that threaten this literary treasure trove smuggled out of Timbuktu last year under the noses of jihadists. When Timbuktu, a centre of Islamic learning between the 13th and 17th centuries, fell into the hands of Tuareg separatists and Islamists last year, researchers at the institute – named after a 16th-century intellectual – feared for the safety of the 40 000 manuscripts in its possession. In a daring act of subterfuge, the institute’s researchers spirited thousands of documents, covering subjects such as religious studies, mathematics, medicine, astronomy and music to Bamako, the capital, more than 965km away. Metal cases were brought surreptitiously to the desert city of Timbuktu, where the documents, some dating to the ninth century, were carefully packed away. Then, over a period of months, the material – mostly written in Arabic, but also centuries-old texts in Greek, Latin, French, English and German – was smuggled out on buses, cars or pirogue boats to the south on the Niger River. Guards at the institute, drivers and boatmen were the unsung heroes in this enterprise. Some 25 000 documents were taken away from the institute between June and October last year, as well thousands of others from private homes. 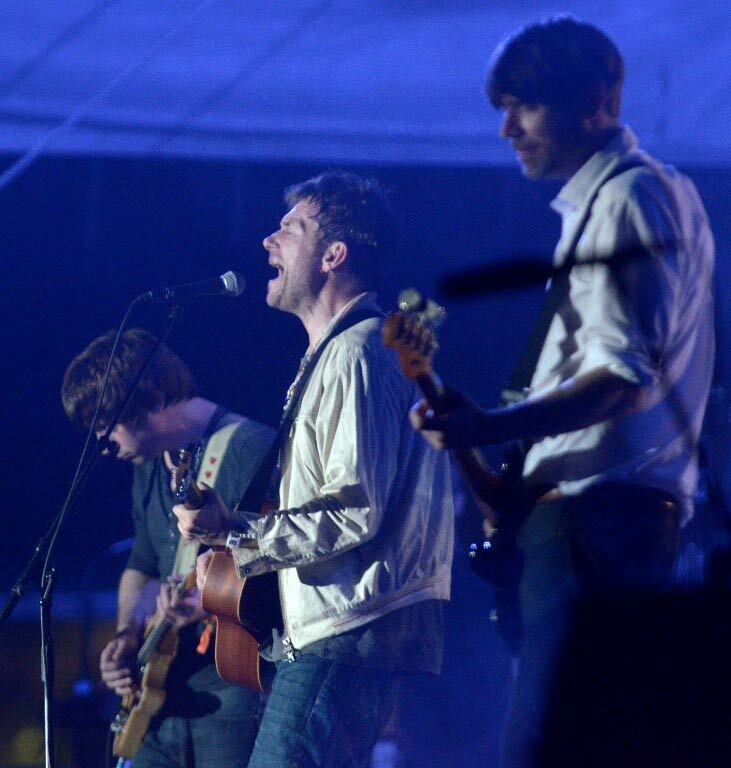 It was just as well. In a fit of pique and cultural vandalism comparable to the destruction of the Buddhist statues at Bamiyan in Afghanistan, the Islamists set fire to the institute’s two libraries containing the manuscripts before the arrival of French forces. Last week, a suicide attack was carried out near the Djingareyber mosque in Timbuktu, which is on the world heritage list of the UN Educational, Scientific and Cultural Organisation (Unesco). 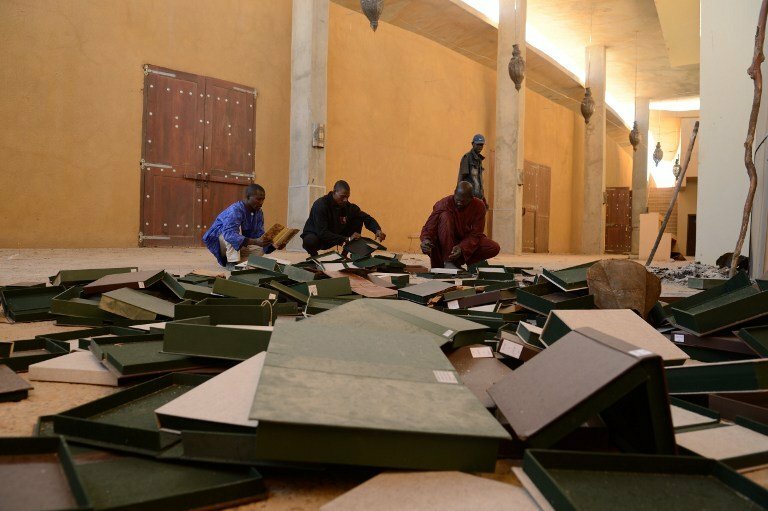 According to Drissa Traoré, head of documentation at the institute, thousands of valuable manuscripts were lost, some destroyed, others stolen. The saved manuscripts are being stored in a nondescript, two-storey faded-rose house in an alley off a main road in the capital. The house stands near an unfinished building, there is rubbish strewn outside on the red dirt road. On a wall around the corner someone has scrawled “empire du mafia”. The location is not publicised, and visitors are vetted by the institute’s head, Dr Abdoulkadri Maïga, who works elsewhere in a cluttered office with a small fridge by his side. He says there are about 100 000 genuine manuscripts, some owned by the institute, others privately owned by families, although some estimates put the number at 300 000. Many of the privately owned papers were also taken to Bamako. After Maïga is satisfied, visitors are dispatched to follow a motorbike driver to the documents. The cases are piled on top of each other in a small air-conditioned room to protect them from Bamako’s humidity. Gingerly, Traoré takes out an 18th-century manuscript on jurisprudence from the top of a case. The battered leather cover is falling apart. He opens the book to reveal exquisitely delicate calligraphy. 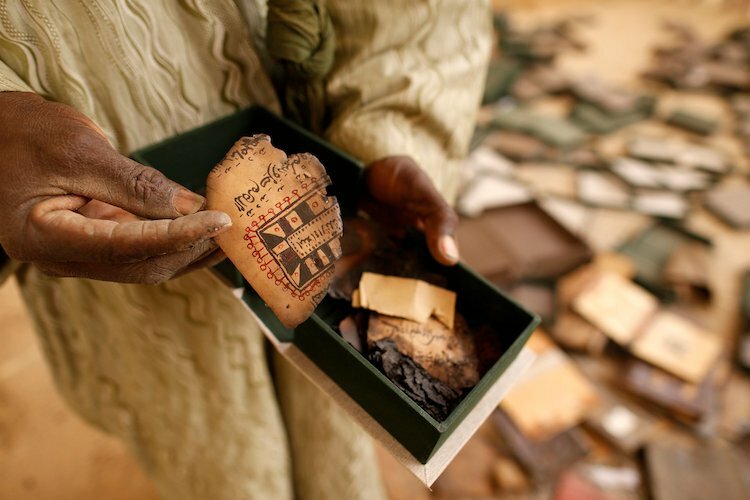 The oldest manuscript at the makeshift library in Bamako dates to the 12th century. 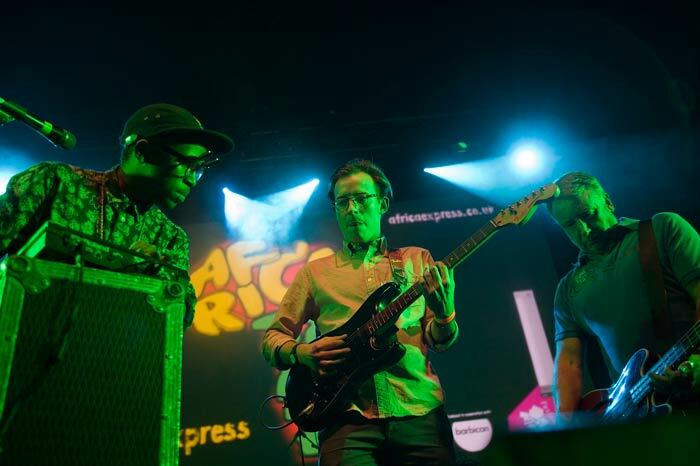 For Diagayeté and his colleagues, the manuscripts cannot return home fast enough. “Some of us have started to go back, but I can’t say when the manuscripts will go, but we want it to be as soon as possible,” he said. In the meantime, the manuscripts have to be protected from Bamako’s “hellish” conditions. Researchers have begun cataloguing the documents and placing them in special brown boxes made from cardboard-like material. These boxes arrived in December, followed by the shelves on which to store them. The shelves arrived only a couple of weeks ago, so the documents have languished for months in their metal cases, hardly ideal conditions for such delicate items. No wonder Diagayeté is exasperated. Part of his frustration is aimed at Unesco, which promised to help the institute. Its director-general, Irina Bokova, said in February that the organisation would do everything possible to safeguard and rebuild Mali’s cultural heritage, which she described as “a vital part of the country’s identity and history and fundamental for its future”. “Its restoration and reconstruction will give the people of Mali the strength and the confidence to rebuild national unity and look to the future,” she added. “Unesco was very, very late. Talk is easy, but action is hard,” Diagayeté said. Three sets of metal floor-to-ceiling shelves have been assembled, and more are being put together. In the long term, there are plans to restore and digitise the manuscripts under a Unesco scheme run by Luxembourg. In the meantime, the institute is adamant that the documents should go back to Timbuktu. “Timbuktu without the manuscripts is without value, and the manuscripts without Timbuktu have no value,” Maïga said. Haidara Aissata Cissé, the only woman standing for president in Mali’s upcoming elections, is greeted by deafening chants of “Chato! Chato!”, her nickname. Cissé is clearly popular among the market traders in Niarela, the old business district of Bamako where sleek office buildings, hotels and embassies stand incongruously among ragtag, low-rise stalls. She is the only candidate to visit the area – or indeed to include walkabouts in their campaign schedule at all. Most political hopefuls have concentrated on rallies in stadiums, and visiting local dignitaries and elders. The capital, Bamako, was never occupied but its already weak economy has been crippled by the events of the past 18 months, including a military coup. The upcoming election on Sunday July 28 has been imposed on Mali by the international community despite widespread fears that the country is not ready. Cissé, a 54-year-old MP and former travel agent, is an outsider among 27 candidates for the presidency. But determined campaigning – and plenty of walkabouts – have improved her following and helped win her the backing of all of Mali’s women’s groups. 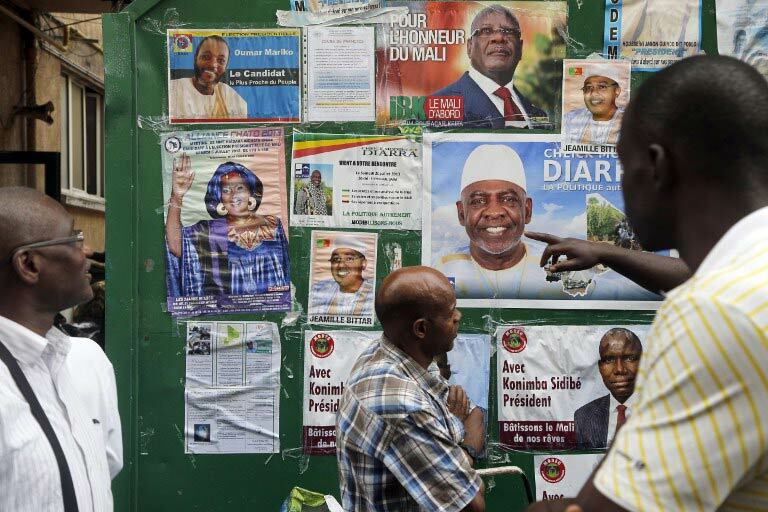 If there is no outright winner on Sunday and the presidential election goes to a second round on 11 August, Cissé could drive a hard bargain between run-off candidates vying for the female vote. Despite the odds, she says she will be the next occupant of Koulouba, the head of state’s palace on a rock overlooking Bamako. She even believes she can get there without giving away the tea, sugar, T-shirts or cash that are common currency in Malian elections. In a country where welfare and education have, in living memory, been the responsibility of western aid agencies and Islamic solidarity, development issues are not vote-winners. Unicef, the United Nations children’s fund, has drawn up a primer for candidates listing some of Mali’s shocking statistics: 90% of women have undergone female genital mutilation; one million children are out of school; 2.2 million people defecate in the open air. Righting those wrongs seems less of a priority for ordinary Malians than building a strong army after the country had to depend on France – and now a United Nations force, Minusma – to secure its borders. For that reason, Cissé’s campaign calls for “a united and strong Mali”. It is the slogan of almost all of the candidates.